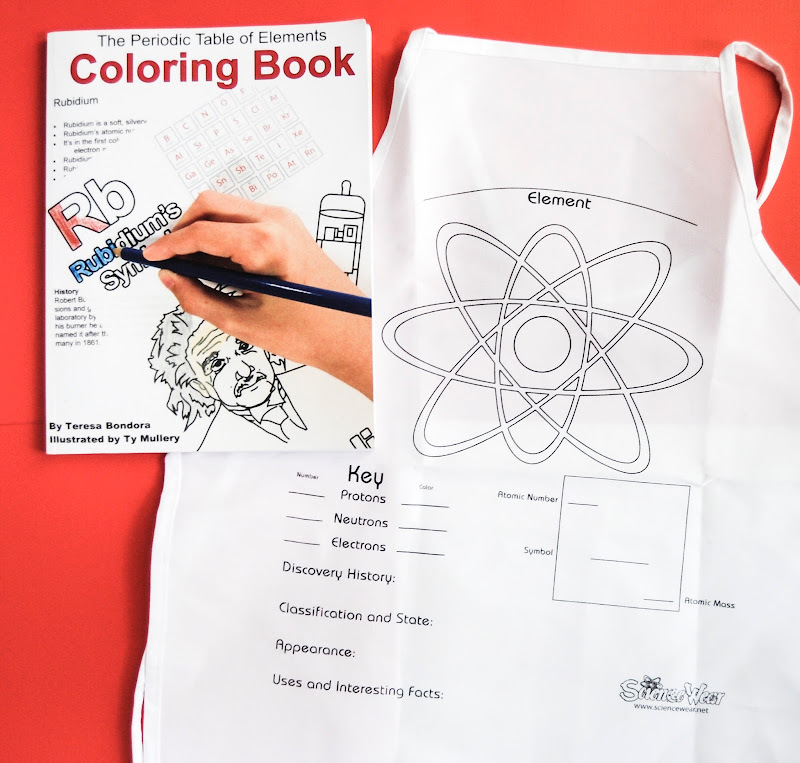 I am so excited to share the Periodic Table of Elements Coloring Book and Science Wear Apron with you today. I was given these products in exchange for an honest review. This blog post contains affiliate links and sponsored links. The Periodic Table of Elements Coloring book was made by Teresa Bondora. Teresa is a former high school science teacher. She also homeschools her children. She saw a need to teach kids more about science especially the periodic table. This first couple pages of the book feature a blank periodic table and a periodic table with element number, name, and symbol. The book then has coloring pages and information pages for each element. The information page two sections, the first has information on element state, bonding information, atomic weight, number of protons and neutrons, uses, and other fun facts about the element. The second section contains history of the elements. 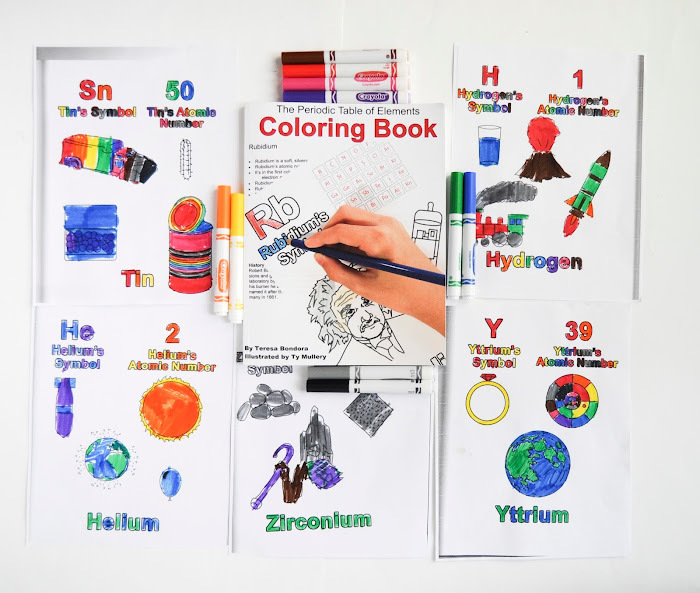 The opposite page is a coloring page with the name of the element, symbol, number and pictures of where it is used. To find a digital ebook on TPT click here. What did we think of the book? The coloring books is a very fun with lots of information for each element. My six year old daughter who just finished Kindergarten was really intrigued with the coloring page and took her time coloring it. My son loved the tin page because it had a car on it. They keep asking to more and more pages. I thought the book was very well thought out and loved that the pictures correlated to the element very well in a way that children could understand it. I wish I had had something like this when I was younger. I remember learning about the periodic table a little when I was in school. I took chemistry in high school, but did not really understand it. My first real exposure to the periodic table was in college where I had to memorize the whole thing in a week. I was deathly afraid of chemistry and did not do very well in it. I ended up majoring in engineering and think if I went back and took chemistry again I would do a lot better. I love that this book introduces the elements to kids at a younger age and makes relates them to common elements with pictures of things they already know about. What would I change? If she did a second edition I would update the pictures to more current art and add a page at the beginning of the book that explained all the important terms about elements and the periodic table; such as protons, neutrons, symbol, number, atomic weight, bonding terms etc. And I would also add more of an introduction to the beginning of what elements are and why they are important. I would also add a glossary to the back of the book with common terms used in the book so parents teaching their kids could explain them if they did not know what the term meant. I will definitely be using this book for my kids to learn the elements. My daughter loved it. The other item I was able to review that went right along with the coloring book was a ScienceWear apron. The apron is white and has places on the apron to fill in information about the elements. There is a large picture of an atom and spots for the number of protons, neutrons, and electrons. There are also spots for the classification and state, appearance, discovery history, and uses and interesting facts. The final spot is a big square where kids can fill in the atomic number, symbol and atomic mass. We decided to do tin for our apron because my son loved the picture of the car on the page and he needs an apron. My kids love to help cook. 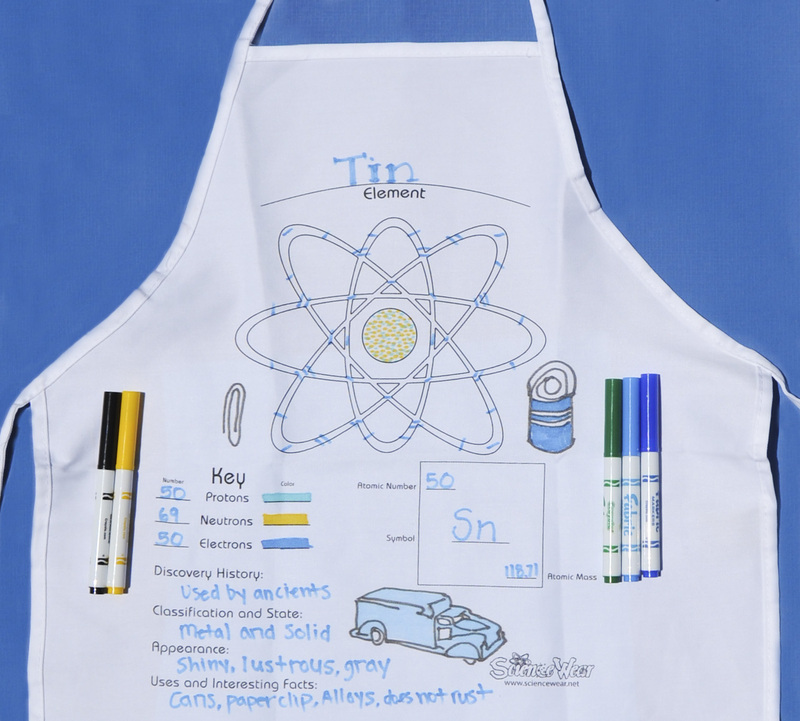 We traced some pictures from the Periodic Table of Elements Coloring Book onto the apron. He told me where to put them and what colors he wanted. It turned out really well. My son loves it and carries it around with his treasures. What did I think of the apron? I think it was really fun, and a good way for kids to learn about the elements and have fun doing it. The price is also very affordable on Science Wear's website. I was so excited to get these items from both of the companies for review. As an engineer I understand the need to teach and empower kids with science at a younger age. I was so scared of it in school. It was not until I was in college I realized I excelled at it and it became my major. I highly recommend these two products to help your kids to learn about science at an early age. what a great concept! Now I want it! :) Will be pinning. Thanks, we love this book! I love the coloring book idea. I was not sure about the Apron, but when I got to the end of the post, it made sense. These kinds of things make me look forward to teaching my girls Chem in a few years! My son loves the apron. How old are your girls?